My toddler is in the “dip” phase of eating. Everything is better if she can dip it in something. Red dip (ketchup) and white dip (ranch dressing) are her main go-to’s, but she is willing to branch out. Today, she asked me for a peanut butter and jelly sandwich for lunch with red dip. Gross. While her obsession can be frustrating, I have to admit that I love dip myself. Chips and dip, veggies and dip, soup with a sandwich to dip, rolls to dip in gravy…really I could go on. The biggest problem with dip is the addition of empty calories. Hummus falls into the traditional dip pitfalls by being somewhat calorically dense, but does at least provide some protein and fiber along the way. I have found that if I pack it full of flavor, I don’t use as much dip either, which reduces the calories. Here are four different variations on hummus we have been enjoying lately (with only pictures of three because I don’t always think things through). 1. Combine ingredients in a food processor. Blend, adding water to achieve desired consistency. Serve or chill until ready to use. Variation 1: Roasted Garlic and Caramelized Onion (where I forgot to take a picture. 2. Take a whole head of garlic. Slice off the bottom to expose the cloves inside. Drizzle ½ teaspoon olive oil on it. Place cut side down on a foil-lined baking sheet. Bake in oven for 20-30 minutes, until soft. Let cool. 3. Heat a medium saucepan over medium-high heat with 1 teaspoon olive oil. Add one thinly sliced onion. Saute until beginning to brown, about 3-5 minutes. Reduce heat to medium-low and continue to cook until deep golden, about 15 minutes. Let cool. 4. 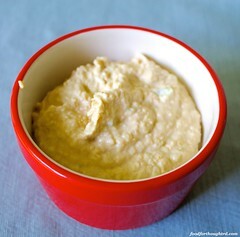 Prepare hummus as above, omitting original garlic. Substitute up to half of the cloves from the roasted head of garlic. Add in the onions. Blend to desired consistency. 1. Preheat a grill or broiler to high. Lightly coat a red bell pepper with olive oil. Grill or broil, turning every few minutes as each side is charred. Once done, place in a paper bag for 5-10 minutes. Remove from bag. Peel off skin. Remove stem and seeds. Chop red pepper. 2. 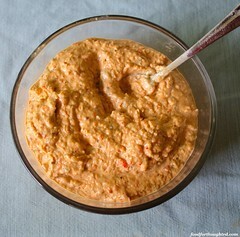 Prepare hummus as above, adding in chopped red pepper. 1. 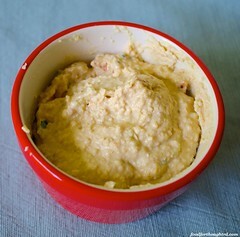 Prepare hummus as above, adding ⅓ – ½ cup julienned sun-dried tomatoes (preferably dried, not packed in oil). Recipe Notes: Don’t be afraid to add water to get the consistency you want. I also found that this solidifies a bit when refrigerated, so maybe err on the thin side if you are not serving immediately. You could also try these variations with my baba ganoush recipe with yummy results. Have you ever made a dish you thought was really delicious but no one else could remember it? It has happened to me a few times, including the first time I made these noodles. I remember making them for a picnic dinner date we went on. I even remember my husband saying he liked it. But anytime I asked him about them, he couldn’t remember what I was talking about. Partly because the only way I could describe them was as “peanut butter noodles” which would usually remind him of the Thai Style Chicken and Noodles I shared before. That is one of his favorites, so the discussion would end. So, these gradually drifted off my radar for about two years. Wow, those two years were really missing something. 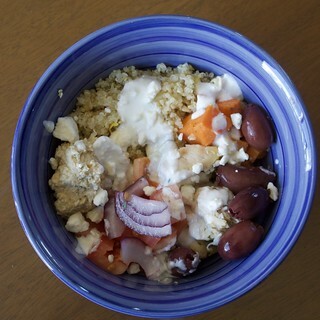 When I rediscovered this to take lunch to a friend, I was reminded of how easy, quick, delicious, and versatile this dish is. And the fact that it is cold makes it perfect for summer. It can be a main dish or a side dish that is easy to transport wherever you need it. I recently made a big batch right before we went hiking, and it made an awesome dinner after a long day of hiking and lugging around a toddler. 1. Sprinkle eggplant with salt. Let it drain in a colander for 30 minutes. OR Place eggplant on several layers of coffee filters or paper towels. Microwave for 10 minutes, or until beginning to look slightly shriveled. 2. Cook pasta according to package directions, omitting oil and salt. Drain and rinse under cold water. Place in a large bowl and toss with sesame oil (if using). 3. Heat canola oil in a medium pan over medium-high heat. Saute eggplant until browned, about 8 minutes, stirring frequently to prevent sticking. Add to pasta. Saute chicken in same pan until cooked through, about 5-8 minutes. Add to pasta. 4. In a blender or food processor, process garlic and ginger until well chopped. Add the peanut butter, soy sauce, brown sugar, vinegar, red pepper, and hot. Process until smooth. (The sauce may be a little thick. If it is overly thick, add more water). 5. 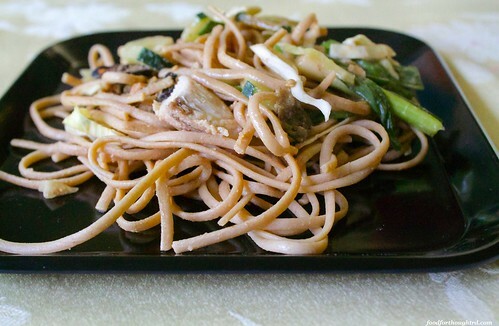 Toss the pasta, eggplant, chicken, cucumber, cabbage, and green onions with the peanut butter sauce. Chill until ready to serve. Recipe Notes: Feel free to mix it up on this dish. I’ve made it without the chicken and without the eggplant. All the combinations have been good. I like the crunch the cabbage gives to this, but I have also omitted that. A hothouse cucumber works really, really well in this. But I’m usually too cheap to buy one, so I just half peel a regular cucumber with good results. Also, you could substitute garlic powder and ginger powder and mix the sauce by hand. It takes a fair amount of muscle, but can be done. Lunch is a really difficult meal for me. I don’t want to expend much effort, but I want something delicious. Sometimes, a pb&j is that sweet spot. I find on the weekends, however, a simple lunch just won’t cut it. Weekends feel like they should have special, slightly more indulgent meals to me. These nachos seem like a bit of work, but they come together fairly quickly. And the reward is huge. Most things taste better on a chip with dip, don’t they? Don’t skip the salsa or the “raita” like sauce. Both make this dish even more special. 1. For the raita, squeeze out and discard the excess liquid from the cucumber. In a bowl, combine the cucumber, yogurt, 2 tablespoons lime juice, and mint. Cover and refrigerate until needed. Can be done up to 24 hours in advance. 2. For the mango salsa, combine mango, ½ the bell pepper, 1 diced tomato, ¼ cup chopped onion, ¼ cup cilantro, 2 tablespoons lime juice, and avocado if using. Cover and refrigerate until needed. Can be done up to 24 hours in advance. 3. Preheat oven to 375. 4. Heat a olive oil in a large skillet over medium heat. Saute remaining onion until translucent. Add beans, remaining pepper, remaining tomato, curry powder, garam masala, and cumin. Cook, stirring constantly for 2 minutes, until fragrant. Remove from heat. Stir in sriracha, remaining lime juice, and black pepper. 5. Line a large, rimmed baking sheet with foil. 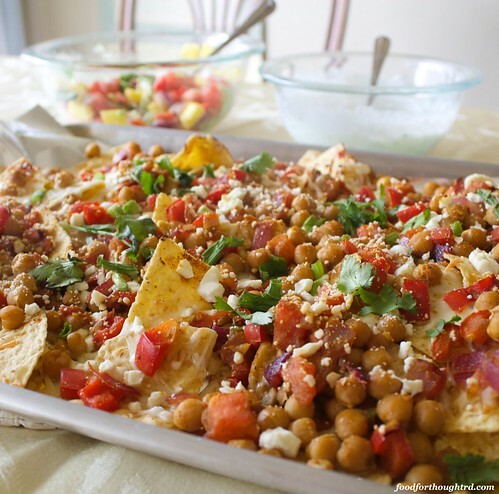 Arrange tortilla chips in a single layer on baking sheet. Top with mozzarella, followed by curried beans and feta cheese. Bake until the cheese is melted and chips are hot and crisp, about 12-14 minutes. Top with remaining cilantro. Serve with mango salsa and raita. Recipe Notes: I kind of chop all the ingredients at once, and even have made the dips as the beans cook. It works just fine that way, you are just very busy right then. The original recipe called for ground turkey or lamb, which I’ve subbed beans for, but I like going the vegetarian route. It also says to drain all the liquid from the salsa and pour it over the top. I kind of like the liquid in the salsa since I prefer to dip it. Draining the liquid means draining flavor to me, but you can try that if you prefer a “dry” salsa.